Potato pancakes, called “latkes” in Yiddish, are probably the most popular and well-known food of Hanukkah. In fact, when people think of Jewish people and culture, they often think of Hanukkah and latkes. Here are some great recipes for latkes, including the traditional potato pancakes, a vegan version, and some other fun versions! Yum! Crispy homemade latkes to celebrate Hanukkah! Cut two of the potatoes into 1-inch pieces. Boil them in salted water 15-20 minutes or until they are tender. Drain the potatoes and mash them slightly. Dust the top of the potatoes with the flour or matzah. While they cool, shred your other potatoes and mix them with the shredded onions as you shred them. (Mixing keeps the potatoes from turning brown). Once mixed, squeeze the onion/potato mixture to drain the liquid from them. Mix the salt, pepper, and eggs in. Mix in the mashed potatoes. Scoop out spoonfuls of the mixture and shape into patties, about 3 inches in diameter. Heat 1/4 to 1/2 inches of oil and fry the patties. Cook them until golden brown (about five minutes on the first side and 2 to 3 more minutes on the second side). Drain your latkes on paper towels. Mix in all other ingredients, except for the oil. Be sure to mix well. Heat 1/4 to 1/2 inches of oil in a frying pan. Using a spoon, drop in the potato mixture in small amounts, then use a spatula to flatten and form patties. Cook on each side just until golden brown. Drain on a paper towel. Mix the potatoes, scallions, eggs, flour, pepper, and salt. Heat oil in a deep nonstick skillet over medium-high heat. Use a 1/8 c. measure to scoop potato mixture into oil, then use a spatula to flatten to a 3-inch diameter. Reduce heat and fry until golden brown (about one and a half minutes per side). Drain latkes on paper towels. Beat eggs together with milk. Mix in the cottage cheese. In a separate bowl, mix the matzo meal with the salt, cinnamon, and sugar. Add the dry mixture into the wet mixture and beat. Spray a frying pan with oil or cooking spray and heat. Use a tablespoon to spoon mixture into pan. Cook until golden brown on both sides. Mix together potatoes, zucchini, and onions in a colander. Let drain for about 15 minutes, making sure to squeeze every five minutes to press out excess water. Mix in the shredded carrots. Mix in all other ingredients except oil. Heat about 2 tablespoons of oil in a pan and fry each pancake until golden brown on both sides. Mix together eggs and orange juice, milk, or yogurt. In a separate bowl mix together the flour, salt, baking powder, and sugar. Mix dry ingredients into egg mixture. Mix in grated apples. Heat some oil in a skillet. Heap a tablespoon with batter and drop into the hot oil in the frying pan. Fry until golden brown (about 2 minutes each side) Drain on paper towels and sprinkle with confectioner’s sugar. 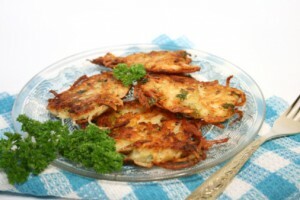 Serve your latkes hot or enjoy them cold for breakfast the next morning! Try topping them with sour cream or applesauce. Enjoy!